IPL 2019: 160 is a good target to bowl at but are Punjab 15-20 runs short? Only time will answer that when the chase begins. IPL 2019: Fans got another confirmation of the fact that cricket is a gentleman’s game at Chepauk. It is when young Chennai bowler Sam Curran got smashed on the right shoulder on his follow through after Shane Watson hit a short ball straight back to the bowler. 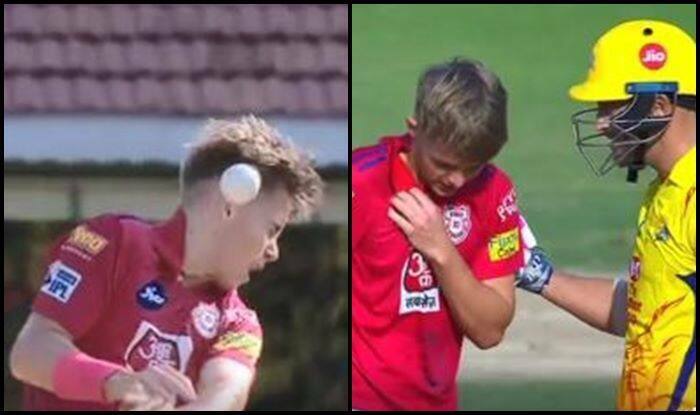 Curran still in his run-up was looking to protect his face from getting smashed, he was in pain. Faf du Plessis realising Curran is in discomfort walked up to him to ask him about how he is feeling. It was a heart-warming gesture from the opposition and these are small things that make cricket a beautiful game. Meanwhile, Faf top-scored 38-ball 54 after Chennai won the toss and opted to bat first at Chepauk. Initially, they did not get off the best of starts as Punjab bowling was disciplined. Ashwin has been the pick of the Punjab bowlers, the skipper scalped three for 23 in his stipulated four overs. He got rid of the top three batsmen from the opposition camp to grab an early advantage. Chennai ended their innings with a total of 160. It was a 23-ball 37 blitz from Dhoni that helped Chennai get to that score as at a certain stage they were struggling to get going. The beginning and the end was superb for CSK as they added 50 off the first 6 overs and 44 of the last three overs but it was the middle where the progress was very slow. It is a good target to bowl at but are they 15-20 runs short? Only time will answer that when the chase begins.